My 83-year-old mother had open-heart surgery last year to repair a leaky valve. One of the symptoms of that condition is shortness of breath. I hoped the surgery would have cleared that problem, but she’s been complaining that she can’t walk to the mailbox without becoming breathless. Why is she still out of breath after her surgery? She also has repeatedly told me she feels excruciating back pain. Despite my pleas, she is reluctant to taking daily pain medication. Her play-by-play accounts of her doctor appointments frustrated me because they failed to give me a clear understanding about what’s happening with her health concerns and her doctor visits. If you have a parent or spouse with mesothelioma you may be experiencing a similar situation. You have lots of questions, but perhaps you don’t feel like you’re getting all the answers. And you really want to know. It felt a bit like overstepping the boundaries when I asked my mother if I could go with her on the next doctor visit. What kind of message was I sending Mom? Because my dad accompanies her to the doctor, I felt like I was declaring both of them incompetent. Truly, though, he wasn’t much help. Thankfully, they were eager and relieved to have me tag along. Mom wants answers to her problems, as much or even more than I do, and Dad welcomed someone else taking the lead. On the appointed day to see the cardiologist, our little band of three trudged into the doctor’s office and followed the office assistant, who shuffled around to find a seat for everyone in the tiny examination room. The doctor soon arrived and began speaking directly to my mom. I immediately saw the problem. The communication breakdown between my mother and the doctor was overwhelming. The doctor asked questions about her visit, but Mom seemed to continually go off topic. Mind you, we were at the cardiologist for her shortness of breath. Mom was having a particularly bad day with her back, so she kept describing that problem. I interjected the conversation numerous times to keep things on track and ensure we were getting answers for the problems the doctor was able to address. It was an awkward situation. Understandably, the doctor wanted to talk to the patient, not necessarily me, but I had to constantly steer my mother. I really couldn’t imagine how this conversation would have continued if I hadn’t been there to referee. 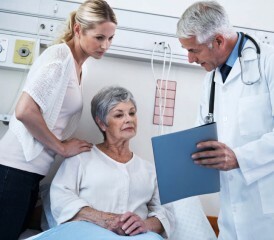 A doctor’s ability to treat a patient is directly related to the kind of information he or she is receiving from that patient regarding the symptoms they are experiencing. If the information isn’t accurate or clear, how can the doctor treat effectively? A week later, we were visiting another doctor for the back problem, and the whole thing played out again. Although this time, my dad elected to sit in the waiting room. In my situation, and possibly yours, if you have a parent or loved one with mesothelioma, their age is part of the problem with how they handle a doctor visit. Age may have affected their memory or maybe they are overwhelmed with not feeling well. I know my mom is sick of being sick. I think once she finally gets her audience with the doctor, her frustrations and thoughts spill out at once, rather than in a linear, coherent manner. But I think there is another factor at play here. My parents grew up in an era where patients put doctors on a pedestal. If a doctor said it, then it must be true. You don’t question it. “He is the doctor after all,” Mom often reminds me. I didn’t go to medical school, but I did graduate from college. I see doctors as educated professionals in their field, but they are men and women just like me. If I am seeing them, I am hiring them to address my problem. They are working for me. I feel complete liberty to question them regarding my condition or treatment. And I expect them to give me ample time when I am there for an appointment. Generally, the older generation doesn’t feel this way. Perhaps they might blindly follow doctor’s orders and accept situations that some of younger patients may question. Wants to ask about different treatments options. Wait times are extended because doctor has too many patients. Doctor doesn’t allow patient enough time to ask questions in the examination room. Doctor brushes off patient’s concerns. According to a 2015 article in U.S. News & World Report, a study in the Annals of Internal Medicine found that patients were allowed to finish their list of concerns in 23 percent of doctors’ visits. And in a more recently analysis, patients were cut off by their physician after an average of only 12 seconds. “Over the last five to seven years, physicians have been placed in a position where they have numerous conflicting task priorities when they go in to see patients,” explained Nirmal Joshi, chief medical officer of PinnaceHealth in Harrisburg, Pennsylvania. Medical personnel nowadays must account for every question and answer in electronic health records, and according to Joshi, check boxes for more than 100 measures, patterns and health outcomes tracked by national organizations. What this means is that even for the bold, visiting the doctor might pose some challenges when communicating. No wonder that for the elderly and the very ill, it can be more difficult to get concerns addressed. A mesothelioma diagnosis guarantees many future encounters with doctors. You may be the daughter or the son whose parent has mesothelioma and you really are not sure what’s going on at those appointments. You’re concerned that maybe more could be done to help your mom or dad. Your parents may be afraid to ask you to begin accompanying them to their appointments because they don’t want to take up your time. Make the first move and offer to go. At first, my mom resisted for a moment because she said I was too busy, but I reminded her that she was never too busy to take me to the orthodontist for four consecutive years. I was always Mom’s priority, and I certainly make her one of mine. Since then, she has thanked me repeatedly for my involvement. Let the office personnel at the doctor’s office know you will be handling your mother or father’s medical situation so they can call you with test results and appointment scheduling. This gives you another chance to ask questions, and it takes that load of your parents. Have questions prepared in advance. Write them down as you think of them and let the doctor know up front that you have questions prepared for him to answer. Let your parents answer the doctor’s questions, but intervene politely if you see them going off track or not answering accurately. See if you can communicate with the doctor via email if you have additional questions. This can save time for you and the doctor. Educate yourself on mesothelioma so you have an understanding of the disease when you visit the doctor with your parent. This will enable you to ask more pertinent questions and also show the doctor that you understand a little bit about the disease. I am so glad I took the time to go to the doctor with my mom. Our trip to the cardiologist revealed her medication wasn’t working and needed a stronger dosage, but we also learned her valve repair was no longer working. The new medication enables her walk to the mailbox without getting out of breath, and she is now under consideration for a new procedure to help the faulty valve. Regarding the back issue, the rheumatologist found a previously unknown problem in her vertebrae. A treatment is planned, and a positive outcome is expected. Mom now is doing better physically and mentally. Dare I say that my involvement may have helped a bit? I think I helped foster the communication to get answers. Beth Swantek has been writing professionally for 30 years. She is a former news reporter and anchor for a CBS affiliate in Michigan and often reported breaking medical and political news. Currently, she teaches media writing and video production at Lawrence Technological University in the Detroit area, as well as working as a freelance writer and producer.